With the holiday season just around the corner, your employees will surely be feeling the holiday spirit – but is your office prepared for the impending break? Help your team stay on top of their work throughout the festivities with these organisational tips. Ask your staff to submit their holiday requests for extended leave as quickly as possible. The earlier you know how many of your employees will be taking additional leave over Christmas, the easier it will be for you to make arrangements to ensure their workload is managed in their absence. You should also speak to key members of staff about potential emergencies that could occur while your office is closed during the holidays. Get holiday contact details for everyone who might be called upon if something unexpected occurs. To avoid a backlog of work and potential added stress for your team when they return to the office after Christmas, use the time in the lead up as an opportunity to reschedule deliveries and look for ways to minimise potential pressure points. It might also be worth redistributing certain responsibilities around the office – some roles will be under less pressure than others. If you're going to be closing your office for several days, make sure you do a green audit before you go. Save energy and reduce fuel bills by switching off any air conditioning, computers, lights and electronic equipment before you lock the doors. This is also the perfect time of year to check over your business’s contingency plan. There are lots of things you can't control, which can be even more hassle to take care of over the holidays, such as unexpected power failures or disasters. Ensure your backup plans are up to date should a problem strike. Even more essential are security checks. Over the festive period, you may have staff members who don’t normally take on extra responsibilities, such as opening or closing the office. Provide all employees with a simple list of the things they need to remember – from turning off the coffee machine to switching on the alarms. To ensure you don't come back to an angry stream of messages after the holidays, communicate your office opening hours for the holidays with all customers and contacts. 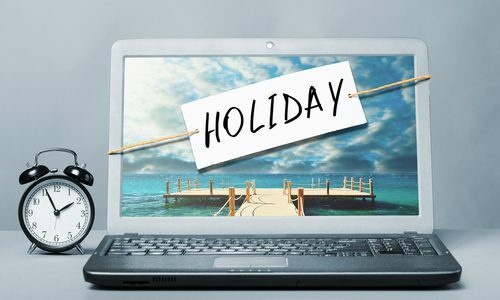 Send out an email to your contacts with your holiday dates, add opening dates and hours to the signature of your team’s emails and post a note on your website addressing any changes to normal working hours. Get ahead of your competition for the New Year and ensure your team is prepared for the Christmas break by planning ahead.